Claddagh door knocker is a solid brass design that is enhanced with Celtic knots. 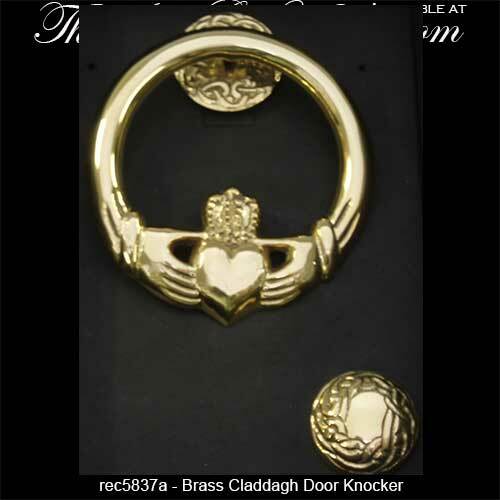 This Claddagh door knocker includes all the required mounting hardware. This medium size Claddagh door knocker features an embossed Celtic knot mounting bracket along with a knot-work motif strike plate and it measures 5 1/4" tall x 4 1/4" wide. This Irish door knocker features solid brass construction and is gift boxed with the Claddagh legend along with a Celtic knot history card, complements of The Irish Gift House. 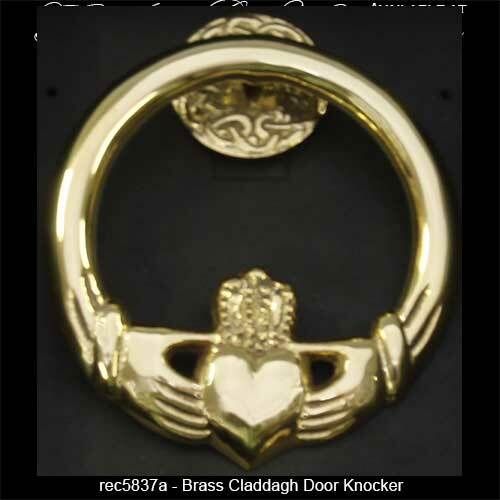 The brass Claddagh door knocker is made in the United States. Claddagh door knocker is a brass design that features a Celtic cross mounting bracket that is enhanced with embossed knot-work. Irish door knocker is a brass design that features the Claddagh nestled inside of a shamrock. Small Claddagh door knocker is made of solid brass and features a Celtic cross mounting plate along with a Celtic knot design strike plate. Brass Irish door knocker features the Claddagh that surrounded by a shamrock.